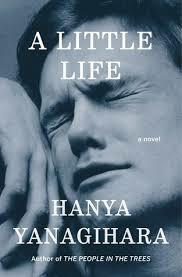 a book chick: "A Little Life"
my take: This is one of my top picks of 2017. And yet, I hesitate to recommend it. A kind of Brothers K ... four young men meet in college and form a diverse, close-knit group. At first it's hard to figure out who is who. With 800+ pages, you have time to get to know each one. One of the four has had an extraordinarily harsh life. As his story is slowly (thankfully) revealed, layers of evil are unearthed. Essentially a love story. How love can wound, maim, and nearly kill. And how love can redeem. How messy our earthly love is, even with the best intentions. Not to mention the worst intentions. The writing is what kept me going. Wow. Beautiful writing of a brutal tale.